The Pediatric Intensive Care Unit (PICU) at Valley Children's Hospital offers 24/7 coverage by pediatric intensivists, board certified in Pediatric Critical Care and many also with subspecialties in Pediatric Anesthesiology. Dedication to interdisciplinary care includes consultations provided by Valley Children’s medical and surgical specialists. The unit has 42 beds and over 130 staff, including 90 specialty-trained PICU nurses, respiratory therapists, and other clinical specialists. Twelve of the ICU rooms are equipped to convert to surgical suites if an emergent event presents itself. 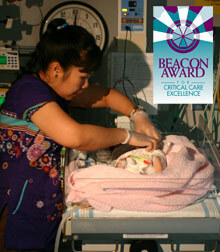 The team cares for nearly 1,500 children and their families each year. The unit is one of the largest in the country based on bed capacity, but it’s another ranking that matters most. In the field of intensive care, severity adjusted mortality rate is a key baseline benchmark, and in this arena Valley Children’s PICU is ranked in the best 10% in the country. The mortality rates are collated from a validated data set which consistently ranks Children’s in the top 1-2 PICU’s out of 33 benchmarked units for the past decade. Great teamwork between the PICU staff, transport team (both ground and air), and a board certified pediatric intensivist group, on duty around-the-clock, contribute not only to the PICU’s great outcome data but also to the unit’s high patient satisfaction scores. The intensivists’ presence means that attending physicians are always in the unit, and residents are never left without the support of an experienced specialist. From open-heart surgery on a heart the size of a walnut, to extracorporeal membrane oxygenation (ECMO) – a life-sustaining intervention for failing heart and lung function – we can provide all the expert pediatric intensive care your child needs right here in the Central Valley. ECMO is life-support intervention for infants and children with potentially reversible life-threatening conditions and less than a 20 percent chance of survival; generally, ECMO improves survival to about 50 percent. Valley Children’s ECMO survival rate is 71 percent since expanding services.